The Bulls will host Bull City Strong Day on May 1 in response to the explosion that took place in Durham on April 10. First Responders will receive a complimentary ticket to the game, and a portion of proceeds from the initiative will be donated to the Durham One Fund. The Bulls' first Bark in the Park game of 2019 is next Monday, presented by Hollywood Feed! Take your lil pupper friend out to the ballgame, boop some noses, let him or her smell all the smells, and maybe even catch a home run ball. The 2019 Promotional Schedule is here! The upcoming season will feature 21 fireworks shows, five Bark in the Parks, 11 Kids Run the Bases, 10 Afforda-BULL Eats and a whole lot more! Mark down the dates you don't want to miss this summer. The ACC Baseball Championship is returning to the DBAP in 2019, as some of college baseball's best teams battle for conference supremacy. Full tournament packages and weekend packages are on sale now, guaranteeing fans the best seats to the biggest games. 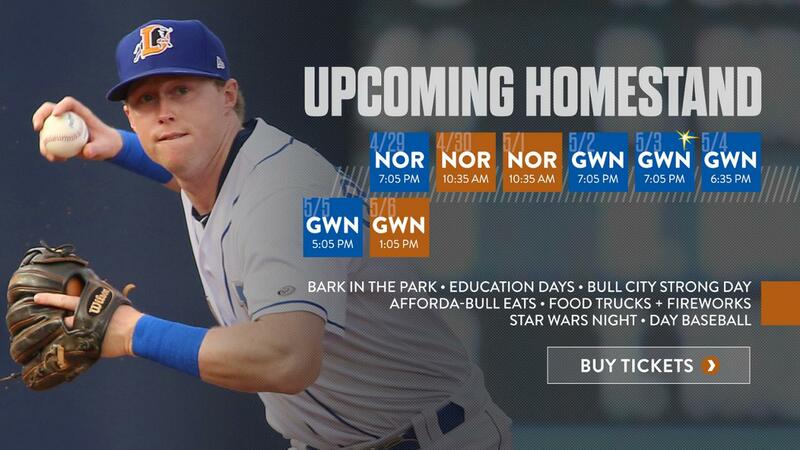 Hit Bull Win Podcast is the official podcast of the Durham Bulls, launched in April 2019. The podcast focuses on behind-the-scenes access and stories to one of America's most famous Minor League ballparks and teams.